Welcome to... my life's quest in Fine Arts! ~ Painting and Art History, with the artist/professor Mr. Dimitris Maninis. Some of my professional activities & art excibitions, recapitulate below! July 2014 : Construction of a mosaic "olive branches" along with two mosaic sign-boards, and supervision of the complete stony revetment of the municipal water fountain, in the village Melissa of Gythio/Lakonia. September 2013 : Supervision of the annual art excibition of "Fine Arts' Games" of the artistic team 'Iraklitos' (of D.Maninis), at the Cultural Centre 'Panetolio' of N.Ionia/Athens. 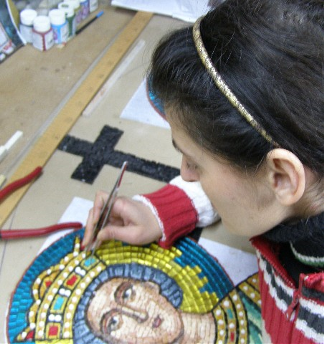 May 2008 : Construction of a mosaic "St.Konstantinos & St.Eleni with the grapevine (Byzantine)", that was placed in the main arch of St.Konstantinos' private church, in Lagonissi/Attica. December 2006 : Construction of a mosaic "Eagle with two heads (Byzantine)", that was placed on the main floor of the St.Apostoli Temple, in Lagonissi/Attica. May 2006 : Decoration of a private company's offices with wall mosaics. 2001 : Decoration of a private luxury restaurant in Passalimani/Piraeus with ceiling painting. 1999 : Decoration of a private beauty salon's rooms with wall paintings. 1993-4 : Assistant of the well-known artist/professor Mr. Nick Maraslis, in conservating and restoring, ceiling and wall paintings of old artistic works in various neo-classical buildings. October 2013 : Paintings excibition "Memory & Present" sponsored by the artistic team 'Iraklitos' (of D.Maninis) at 'La Soiree De Votanique', Athens. June 2006 : Mosaics excibition, at the Cultural Center of Spata/Attica, sponsored by the 'Club for UNESCO of Piraeus & Islands', in co-operation with the private 'Museum of Minerals & Fossils K.I. Ikonomopoulos'. August-September 2005 : Paintings-Mosaics-Pebbles excibition, at the Cultural Park 'Chrissalida', at Kalyvia/Attica. May 2014 : Fine Arts excibition "21 Artists of Saronikos", at the Cultural Centre 'Polytropon', Kalyvia/Attica. November 2013 : 5th Paintings excibition "Women Artists", at the Cultural Centre of Lagonissi/Attica. October 2013 : 7th Fine Arts & Photography excibition, "People, Color & Iron", at N.Zoni of Perama/Attica. September 2013 : Annual Paintings excibition of the artistic team 'Iraklitos' (of D.Maninis), at the Cultural Centre 'Panetolio' of N.Ionia/Athens. November 2012 : 4th Paintings excibition "Women Artists", at the Cultural Center of Lagonissi/Attica. September 2012 : Paintings excibition of "Fine Arts' Games" of the artistic team 'Iraklitos' (of D.Maninis), at the Cultural Centre of Peania/Attica. September 2012 : Paintings excibition of "Fine Arts' Games" of the artistic team 'Iraklitos' (of D.Maninis), at the Cultural Centre of N.Makri/Attica. July 2012 : Paintings excibition of "Fine Arts' Games" of the artistic team 'Iraklitos' (of D.Maninis), at the Greek-French Institute, Kolonaki/Athens. June 2011 : Paintings excibition of "Fine Arts' Games" of the artistic team 'Iraklitos' (of D.Maninis), at the gallery 'Mabrida', Koropi/Attica. June 2010 : 12th International Conference of Modern Mosaic Artists of AIMC, at the 'Theocharakis Institute' & at the Excibition Centre of Freedom's Park, Athens. May 2010 : 14th commercial excibition "Light from Art without Dawn" of the 'Athens' Archbishopric' at the Excibition Centre of 'Zapio Mansion', Athens. March 2010 : Paintings & Mosaics excibition, "Work of Art-Woman", at the Public Library of Piraeus/Attica. November 2009 : "29th Greek Fine Arts excibition 2009" of the Cultural Association 'Parnassos' - Award granted. October 2009 : 1st Paintings excibition "Women Artists", at the Cultural Center of Lagonissi/Attica. September 2009 : Paintings excibition of "Fine Arts' Games" of the artistic team 'Iraklitos' (of D.Maninis), - "D.Maninis and his students-Reformations 1", for Biennale 2009 at the institution 'Antonio Dal Ponte', Venice/Italy. July 2009 : Mosaics excibition "Ancient Greek Civilazation-Constant Inspiration", at the National Archaeological Museum of Athens. June 2009 : Paintings excibition of "Fine Arts' Games" of the artistic team 'Iraklitos' (of D.Maninis), at the 'Centre of Fine Arts' at the 'Kampas estate', Palini/Attica. March 2009 : Paintings & Mosaics excibition, "Work of Art-Woman", at the Public Library of Piraeus/Attica. November 2008 : Fine Arts excibition "Amateurs" of the 'Art Point (Σημείο Τέχνης)', at the 4th municipality aof Athens. October 2008 : 6th Fine Arts excibition of western Athens (ASDA), at the Excibition Centre of Peristeri/Athens. September 2008 : Paintings & Mosaics excibition, sponsored by the 'Club for UNESCO of Piraeus & Islands', at 'Art Gallery Cafe', Voula/Attica. April 2008 : "28th Panhellenic Fine Arts excibition 2008" of the Cultural Association 'Parnassos' - Award granted. March 2008 : Paintings & Mosaics excibition, "Work of Art-Woman", at the Excibition Centre of Tavros/Attica. March 2008 : Paintings & Mosaics excibition, sponsored by the 'Club for UNESCO of Piraeus & Islands', at the Gallery 'Florakis', Piraeus/Attica. January 2008 : "2nd International Scientific Conference of the Greek Physics Association - Science & Art", at 'Technopolis of Athens', Gazi/Athens. November 2007 : Commercial excibition "Woman Show 2007" of the 'Vivere' magazine, at the Greek Olympic Stadium, Ag.Kosmas/Athens. October 2007 : Commercial excibition "International Beauty Conference 2007" of the 'Vivere' magazine, at the Excibition Centre of Peristeri/Athens. August 2007 : Paintings & Mosaics excibition, sponsored by the 'Club for UNESCO of Piraeus & Islands', at the Cultural Centre of Galatas/Poros island. June 2007 : Paintings & Mosaics excibition, with the Fine Arts Association 'Apellis-Fine Arts Greek Artists Association', at the Greek-French Institute, Kolonaki/Athens. June 2007 : Drawings and Paintings excibition with the working-team of the painter/professor Mrs. Eugenia Psaroni, at the Cultural Centre of Ilion/Athens. May 2007 : Commercial excibition "Festival of Energy Travels 2007" of the 'Vivere' magazine, at the Excibition Centre of Peristeri/Athens. May 2007 : Paintings & Mosaics excibition "Colors of Civilasation", sponsored by the 'Club for UNESCO of Piraeus & Islands', and by 'P.E.L.T.-Panhellenic Association of Literature and Art, at the public Library of Piraeus. April 2007 : "27th Greek Fine Arts excibition 2007" of the Cultural Association 'Parnassos'. March 2007 : Paintings & Mosaics excibition, "Work of Art-Woman", at the Cultural Centre of Galatsi/Athens. March 2007 : 5th Fine Arts excibition of western Athens (ASDA), at the Excibition Centre of Peristeri/Athens. September 2006 : Paintings & Mosaics excibition, at the Cultural Park 'Antonis Tritsis', Ilion/Athens. August 2006 : Paintings & Mosaics excibition, sponsored by the 'Club for UNESCO of Piraeus & Islands', at the Public Library of Piraeus/Attica. June 2006 : Drawings and Paintings excibition with the working-team of the painter/professor Mrs. Eugenia Psaroni, at the Cultural Centre of Ilion/Athens. April 2006 : Paintings excibition at the Cultural Center of Gyzi/Athens. April 2006 : "26th Greek Fine Arts excibition 2006" of the Cultural Association 'Parnassos'. November 2005 : Mosaics excibition with the working-team of the mosaics artist/professor Mrs. Elena Stathopoulou, at the Cultural Centre of Galatsi/Athens.